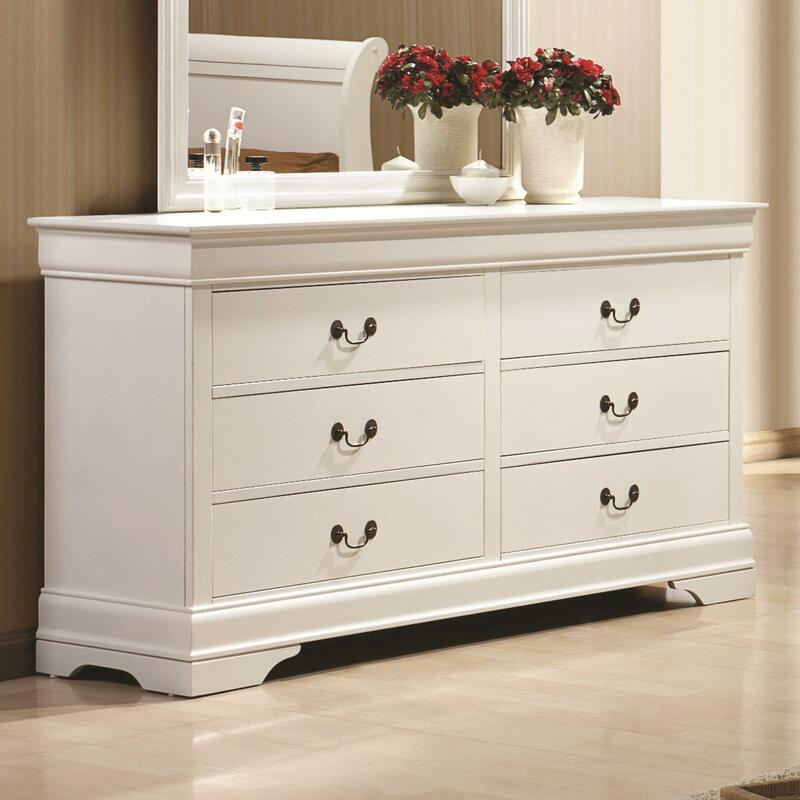 The combination of casual charm and functionality make this dresser a good fit for any bedroom. The 6 drawers provide ample storage space and the French dovetailing style add durability and function. The Louis Philippe 204 6 Drawer Dresser by Coaster at Al-Mart Furniture in the Oak Park, River Forest, Chicago, Elmwood Park, Forest Park, River Grove, Maywood, Melrose Park, Berwyn, Cicero, North Riverside, Brookfield, Lagrange Park, Franklin Park, Norridge, Oakbrook, Elmhurst, Bensenville, Lyons, Stickney, Harwood Heights, IL area. Product availability may vary. Contact us for the most current availability on this product. 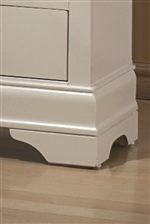 The look of simplicity and elegance rolled into one make this collection a great fit for anyone who wants to incorporate traditional elements into a bedroom set while maintaining a casual feel. The Coaster Louis Philippe Bedroom Collection combines both the elements of traditional and casual bedroom styles. The white finish lends a casual tone that is complimented by the antique brass finished hardware and bracketed feet which provide more of the traditional feel. The Louis Philippe 204 collection is a great option if you are looking for Transitional furniture in the Oak Park, River Forest, Chicago, Elmwood Park, Forest Park, River Grove, Maywood, Melrose Park, Berwyn, Cicero, North Riverside, Brookfield, Lagrange Park, Franklin Park, Norridge, Oakbrook, Elmhurst, Bensenville, Lyons, Stickney, Harwood Heights, IL area. Browse other items in the Louis Philippe 204 collection from Al-Mart Furniture in the Oak Park, River Forest, Chicago, Elmwood Park, Forest Park, River Grove, Maywood, Melrose Park, Berwyn, Cicero, North Riverside, Brookfield, Lagrange Park, Franklin Park, Norridge, Oakbrook, Elmhurst, Bensenville, Lyons, Stickney, Harwood Heights, IL area.